A group of Gamigaya traceries consists of drawings of human. They have been illustrated either separately or together with astral or animal compositions. From the iconographic viewpoint, the human figures vary from each other. They have mainly been described schematically. On one of the illustration on the rock we encounter with complex composition. On one of these descriptions a human head is illustrated by circle and his arms are bent from the elbow. The figure’s body is circled from the edges and divided into four parts as a square. Under it there is a quadrangle divided into six parts and the edges are circled. Animal like ledges completes its upper edges. On one of the drawings on the upper side there is described a he goat, on the lower side there is a man holding a hand stick; under this scene on the right side there is illustrated a goat with a bird between its horns; below the goat there is a wild animal attacking to another one, on the left there is a snake which’s tail is separated into three parts; there is a quadrangle divided into four parts which is held in snake’s mouth and on the left from them there is described a sign looking alike a hook. A description of goat on a very upper part, without doubt, is connected with goat cult. Below from them given description of human figure is an owner of the earth and mountain. There are beliefs in Azerbaijan folklore that everything has its owner. The owner of water, mountain and forest sometimes become visible for the humans and helps them. The hand stick that he holds is not an ordinary one. If he is a protector of earth then his hand stick should be magic. Let’s also note that, in relation to the magic hand sticks there are some folklore samples. As to us, this is a very hand stick that later symbolized a reign of tribe leader or a ruler. It can serve as a proof that, in old descriptions and grave monuments we also meet with the similar symbols. To our mind, another magic feature of this hand stick is connected with its feature of being life tree. Down, the scene of animals’ struggle has a universal meaning and it shows that death is inseparable condition for human life. A quadrangle shown in front of this scene, which is divided into four parts, is illustrated in the meaning of horizontal world. Tightening of snake’s tail, to our mind, is connected with an ancient magic. In Azerbaijan folklore knotting the devils tale, which is the symbol of evils, is given in the meaning of finding the thing, which is lost, overcoming the accident. In this illustration tightening a snake’s tale should be interpreted as overcoming the death. As it is evident, this illustration has a deep content and reflects an entire world outlook of the ancient people. On one of the drawings there is described a group of three people. One of them has raised his hand upwards and the next one has stretched his hands to sides. A man described in the front is three fingered. A little bit up from this one, there is an illustration of cross. On the upper part of human descriptions there is an illustration of goat. On one of the goats horn there is tightened a ribbon. The researchers noted that a three-fingered figure symbolizes an image of God, which is connected with Heaven and water. That is why we can tell that a three-fingered figure is a spirit of protector or it symbolizes the God. By our mind, in this illustration it is described a sacrificing ceremony. Tightening a ribbon on one of the goat’s horn is a tradition peculiar to Azerbaijanis and other Turkish nations. On one of the drawings in the centre there is described an oval circle divided into four parts, there are raying wavy lines coming out from this circle and there is a fantastic entity between them; a little bit on the lower side there are described two snakes. On the right side there is described an arc shape line connecting the circle and below it there is depicted a human figure with horizontal circle which is divided into four parts; it gives the meaning of horizontal space. By our mind, the descriptions on the left side represent the chaotic forces in the clearly illustrated image of snake. Arc shaped line on the right side gives the meaning of Heaven. From here we can also tell that a human figure represents a spirit of Protector or symbolizes the image of God. On this illustration it is shown protection of horizontal and cultural world from the chaotic forces. As we mentioned, there are some samples in Azerbaijan folklore when the sun is freed from the evil forces. On one of the compositions related to goats’ description, a he goat is described on the upper side and below that there are a goat and kid descriptions; on the left side there is described a man who has stretched his arms to the side. 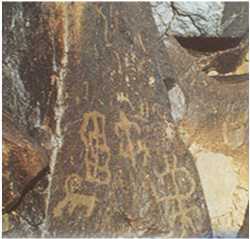 On the left side it is described a wild bird attack to the goat and a lion’s movement towards the goats’ babies. This illustration brightly expresses a structure of the cosmic world model. Description of the God on the upper side is connected with zoomorphic ongons describing the God of productivity. On the lower side there is described a middle world where in its one side there is a death and on the other side there is a life. The representative of the other life - lion and snake is located in the lower position of this composition. It was noted by Vali Aliyev that there are some collective dancing scenes on Gamigaya. On the head of one dancing one there is a horned mask. On one of the group drawings three humans and from below of them there are given some symbolic signage. One of the humans has raised his hands up, and another one has stretched his arms to the sides. In one of this humans hand there is an arrow and a shield. According to the opinion of the researchers the human who has raised his hands up he prays the God, and the person stretching his hands to the sides is connected with success, protection and defense. It should be emphasized that some human drawings are described by three ledged descriptions. On Gamigaya, as well as on the clay utensils belonging to Bronze Age, the humans’ hand is described as three fingered. The researchers connected with the likely signage have been unanimous. The human figures depicted in this signage are connected with spatial forces. Some parts of the human images depicted together with astral and animal drawings within one composition show the ceremonies connected with totem and praying. In several places we meet the drawings illustrating praying. The researcher Vali Aliyev has published these drawings. On one of the drawings there is described a man raising his hands up and on its top it is shown a pair of circles as a symbol of twins. A pair of circles, which was a symbol of twins sometimes, had been identified with the woman God and had been reckoned the beginning of productivity. By the archeological findings, it has been proved that the attached triangles are also related with this symbol. On Gamigaya pair of triangles has expressed some animal images. We think that on these illustrations there are described humans’ praying ceremony connected with twins and productivity. On another drawing there is described a human with raised hands and on the top of it we see a goat. On this illustration it is depicted a human’s worship and praying in front of the goat totem. In Gamigaya, it is quite regular of giving the similar descriptions. It is because, that after the formation of processing economy the likely humans’ life had to a much extent been dependent on the nature and on the gift of Holy Ghost. The human beings have always been looking for the ways of how to increase a productivity that is needed for the existence and development of the society. For that reason they have been conducting various ceremonies and etc calling, pleading the extraordinary mighty forces to help them in increase, reproduction and protection of the harvest. The researchers have repeatedly shown that the figures with hands up are connected with praying ceremony. In Gamigaya the lower part of one of the schematic human figures with hands up is completed with the circles, which are divided into four parts. There are four ledges in the middle of its body. There is described an image of goat next to it. To our mind this symbolized the God of harvest. Vali Aliyev has interpreted one of the drawings as a human holding a hand whip. Without doubt, here the author connected it with practical animal breeding. This illustration is a very popular image of the Oriental art, where a human is holding a snake in his hand. A human’s head is long and it looks alike a bird’s beak. On one of the drawing there is described a goat holding a grass in its mouth and a man approaching to it with his hands stretched aside. Around the head of the human with a sharp raised cap there is a pair of circles. On the right there is described a moving to back hunter. As we mentioned above a pair of circles symbolizes the Venus. A grass in goat’s mouth is a holy food given by the God. This drawing can be counted a sample where hunting is prohibited for provision of productivity. On another drawing there is described a three layer structured cosmic symbol, and below that there is a legendary hunter. Here, it is clearly depicted a magic and success which are connected with hunting. On one of the inscriptions on the rock there is illustrated a man with his hands stretched aside, on the top of his head there is a goat, and a bit up to it there is a mountain goat and a kid. On the left side of this scene there are two circles whish have been connected with straight line and a circle, which is divided into parts by crossing lines. In this drawing it is described an idea of protection of conscious, related to success. A pair of circles, which are connected with straight line, is called tamga. And, without doubt, each tamga symbolizes a definite sign. Eventually, this drawing tried to describe the notions of this and another world. On the other side of the rock, there is a quadrangle that is divided into several parts, inside some of them there is shown a small oval circle. On the top of the quadrangle there is described a goat moving towards the right. We have already mentioned above that a quadrangle divided into several parts symbolize a space. Eventually, here it was described a scene of protection productivity which was connected with the remaining of totems. Some compositions describing a human reflect hunting scenes. On one of these illustrations there is described a human holding an arrow and hook and a group of goats. A hunter’s one hand is stretched to goat’s head and his arrow is directed to its foot. Without any doubt, here is not described a scene related to hunting, but a ritual connected with hunting cult. This ritual should have provided success for hunting. On another image there is described a human holding an arrow towards a goat. On hunter’s head there is a circled cap and on the part of his shoulder there is somehow a longish ledge. A hunter has targeted a goat from the back. On one of the drawing compositions containing a goat and human there is described a hunting scene; on its top it is shown a half moon and on the right from there it is depicted a fantastic creature charkhi-falak. As if by holding from the arrow of hunter, it wants to make an obstacle to him. Bits down there are illustrations of goat and on the lowest part there are snake images. In this scene a recall of the model of three-layered cosmic world is clearly seen. On this illustration there are shown the scenes of the necessity of overcoming the needless hunting and provision of productivity, which are connected with hunting myths. As it is known, the old hunters before going to hunting have been performing some ceremonies accompanied by magic and praying; the hunters have been praying the God for the successful hunt and have sought a help and assistance from the God. The myths connected with hunting have been widely reflected in Azerbaijan folklore. In multitude of folklore samples it is shown that that all animals have their owners and all hunters are protected. In Gamigaya we also meet the collective hunting scenes. On one of the illustrations on the top there is shown an astral sign, below that on the right side there is a man holding an arrow in his hand and also there the images of goat lying on its back upside down. One of the wild birds has put its beaks on the lying goat. The one holding harpoon in his hand wants to take the wild animal away. On the left from these illustrations there is a deer, and in front of it there is a hand stick. The composition is completed with snake, which is shown under it. As it is seen, in this drawing the protecting spirits drive the wild animals away from the shoal. The spatial world is shown by astral signage; snake depicts a chthonic world. The humans’ struggle with the animals is given in the meaning where a human wants to bar the ways to the death. The hand sticks given in front of the deer are connected with the old magic idea symbolizing a protection from the evil spirits, death. On the second composition, there is illustrated a man holding an arrow and hook in his hand. He held the rope tightened on one of the animals and directed his harpoon towards the belly of the wild animal. A bit up there is an image of goat. Below that is an image of human, which eventually protects the animals. On this illustration as well, there is shown an idea of defending domestic animals from the wild ones, and protection of hunting. A definite part of Gamigaya drawings consists of extraordinary creatures. A goat like animal’s tail is bent as a spiral towards its back. It has a spiral shaped camelback on its back. An animal having a body similar to a tiger has got a half moon shaped horn. Goats like animal’s horns have protruded to shape a curled snake. On the scene where is described an attack of the wilds to the goat, one animal is winged. Two-headed snake images can also be included into this group. Description of polymorph and fantastic creatures is peculiar for the old art works. The researches have proved that the likely animals’ descriptions are connected with the thought of humans about the structure of the world; it is linked with contradiction, struggle and mutual interrelation of this and other worlds. On one of the illustrations similar to this there are described the following sceneries: an animal, the tail of which is separated into two parts, below that a got which has a hand stick between its horns, and below that a goat which’s body, tail and horns are integrated on three layers. Brush like signage symbolizes a rain. A hand stick between goat’s horns shows its protection. On the lower side a two-horned creature symbolizes productivity. Here again we meet with some performances connected with magic. Eventually, this drawing is a metaphoric expression of the scenes where humans try to overcome the dry, provide and protect productivity. On one of the fantastic compositions, it is illustrated a grazing deer, behind that there is a half moon, and on the upper side there is described a fantastic creature sitting on the deer and, more eventfully, this is a devil. This description gives an idea of driving the devil away and protecting the productivity. Human images are also included into the descriptions of the extraordinary creatures. Some of their heads look like the bird’s beak. To our opinion, it is a hint to their advocacy mission carried out between the heavens and earth. It should be noted that in Azerbaijan folklore we also meet the extraordinary figures. Akil-bakil’s depiction in the shape of bird and human, or getting a water nymph to be resembled to a half human and half fish shape could serve as examples for this. As we mentioned before, we can also meet a half human and half fish shapes among Nakhchivan monuments. It was said a very few words about the content of Gamigaya traceries. The research analyses of the mythological images in Azerbaijan folklore are also done insufficiently. A study of Azerbaijan’s ancient art treasure would be impossible without learning and involving a wide range of folklore and ethnographic materials. Registration and publication of the entire Gamigaya drawings could also be helpful in study of “confused” illustrations. But despite of all these, Gamigaya is a mythical way of thinking, it is an outlook of the ancient folks and a perpetuated memory of our nationm.